I got the idea for creating this page the day before Hallowe’en when thinking about foods that scare me (See the full post on Scary Foods). 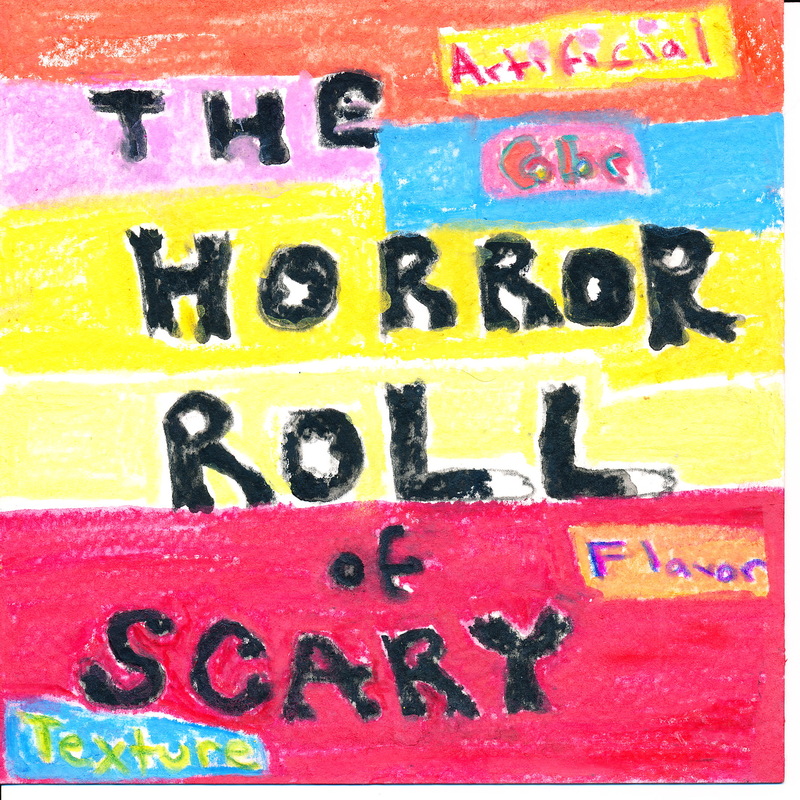 The Horror Roll is for “foods” far removed from the real foods that inspired them Readers are encouraged to submit candidates for the Horror Roll in the Comments section either here or in the Scary Foods. Nominate whatever you want, including my beloved Crisco shortening, Cheez-Its and Golden Grahams. I reserve the right to control what actually makes it onto the list. Please remember to reserve your spleen for the products themselves and not the people who nominate them. New Development: An asterisk indicates a product nominated more than once! Spaggetti-Os, Chef Boyardi and Ricearoni, can feel the grease coating my tongue as I imagine taking a bite of any of these. Good ones, Lorna. I’m adding them now. Just saw that Spagetti O’s were already added. How about Spam? Oh, excellent choice, Jane! Spam is going up now. I confess. I absolutely despise Jello with marshmallows. I also do not understand energy drinks and that “5-hour energy” that recently came on the market. Real coffee has panache these will never have, in my opinion! Ha! Thank you. Playful venting is a good thing. Adding them to the list, Granny. We don’t like Jello either — gelatin is another matter (useful for panna cotta and Bavarian cream, which I never make either). Yeah, I almost put those orange peanut-butter crackers on the list. Hamburger Helper, definitely. And I won’t defend Fruit Loops. I like Ritz crackers though and your grandmother would have recognized pickle relish — maybe even put it up herself. Let’s put canned fruit cocktail there on its own — we’ve already mentioned Jello. My Polish Jewish grandmother would not even recognize dill relish. My other grandmother would neither recognize relish or put anything up herself. Wonder bread was also an unknown product. I grew up believing it probably wasn’t kosher. MSG. Real food can be made scary by simply adding this horror. Good point, Karin. It’s going up soon. Would that be all hot dogs, Linda, or just certain ones? And you a native New Yorker! Maybe all bologna? Unless there is something real called bologna in Italy — anybody know? speaking of spleen, that & lung are 2 organ meats I will not eat. you can add chicory to your list. I have to say, a roommate of mine used to buy something called “potted meat” – I’ve never eaten it, as even looking at it brought a shiver to my spine! Besides, the name is suspicious on it’s face: what *kind* of meat are we talking about actually? So that is my contribution, and if anyone can give an explanation of what it is I’d be grateful. Done. I’ve added it. Thanks, Barb. Most definitely. Add your “favorite” GMO foods to the list. ‘I can’t believe it’s not butter’ and even worse ‘I can’t believe it’s not butter’ as a spray.